President Trump and Russian President Vladimir Putin speak to the media during a joint press conference after their summit on Monday in Helsinki. 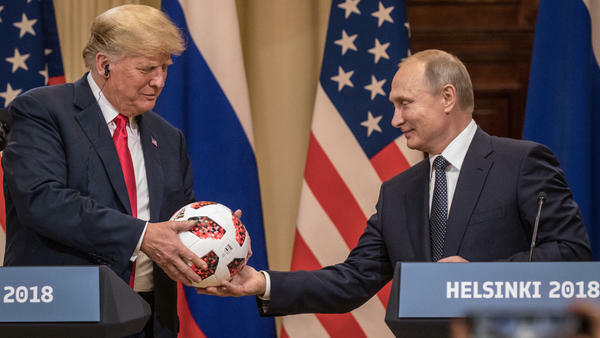 Russian President Vladimir Putin hands President Trump a World Cup soccer ball during a joint news conference after their summit on Monday in Helsinki. Sen. John McCain, the Arizona Republican, called it "one of the most disgraceful performances by an American president in memory." Sen. Bob Casey, the Pennsylvania Democrat, said Trump had "shamed the office of the presidency" with his "dangerous and reckless" reaction to Putin — "a new low and profound embarrassment for America." The mildest judgment seemed to be that the president's whiff was a missed opportunity. But at the other end of the Twitter scale was former CIA Director John Brennan, calling it "nothing short of treasonous." House Speaker Paul Ryan, R-Wis., rejected the idea of "moral equivalence" between the U.S. and the Russian Federation. Senate Majority Leader Mitch McConnell, R-Ky., spoke to reporters as he entered the Capitol on Monday. "As I've said repeatedly, the Russians are not our friends and I entirely agree with the assessment of our intelligence community," McConnell said. The president on Monday had evinced little if any concern about the overwhelming evidence of Russian interference — even after having acknowledged moments earlier the consensus reports from U.S. intelligence regarding that interference. Yet it was striking to see him nod as Putin denied any involvement, and when Putin owned up to wanting Trump to win the election "because he [Trump] talked about bringing the U.S. Russia relationship back to normal." Trump even cited the advice he had received from his own director of national intelligence, Dan Coats, the Republican former senator from Indiana, who had spoken to the president directly. "My people came to me. Dan Coats came to me, and some others," Trump said. "They said they think it's Russia. I have President Putin. He just said it's not Russia. I will say this: I don't see any reason why it would be." Coats also just repeated that the Russians had been behind the attacks, that they had done it to boost Trump's candidacy and that they were still at it now. "The warning lights are blinking red again," Coats said, as they had in the days before Sept. 11, 2001. Yet here was Coats' boss, live on the world stage, deliberately passing on the opportunity to confront Putin about the attack and hold him accountable — two things the White House and various administration officials had promised he would do. In a tweet Monday afternoon, the president appeared to address the blowback and clarify his earlier remarks. "As I said today and many times before, 'I have GREAT confidence in MY intelligence people,' " Trump wrote. "However, I also recognize that in order to build a brighter future, we cannot exclusively focus on the past – as the world's two largest nuclear powers, we must get along!" But, one weekend story in The New York Times — based on several anonymous sources described as close to the president — suggested that the president's pride in winning the White House simply cannot abide any suggestion that he had help. The story was far from flattering, suggesting an ego so boundless as to substitute personal myth for plain reality — not to mention the national interest. Yet the story could also be read as a subtle defense, a relatively benign explanation for what might be called a presidential blind spot. This is akin to those analyses exploring how "meddling" as a verb trivializes the Russian assault, or suggesting that the U.S. has also taken an interest in elections around the world. This "everyone does it" defense was picked up by Sen. Rand Paul, the Kentucky Republican, among others. But competing theories for Trump's behavior abound. On one extreme we have Jonathan Chait's frankly speculative construct in New York magazine that suggests Trump became involved with various Russian figures as far back as the late 1980s, when he needed money and could not raise it in the U.S. — a situation that has recurred several times since with far larger sums of money. Others prefer to see Trump's affinity for Putin as part of a pattern of preferences among world leaders. The U.S. president has also expressed admiration for such autocratic leaders as Turkey's Recep Tayyip Erdogan or the Philippines' Rodrigo Duterte. Then, of course, there is the enduring tale of the "Russia dossier," compiled by former reporters and intelligence agents, research begun initially for anti-Trump conservatives but ultimately under the sponsorship of the Clinton campaign. The dossier alleges a variety of activities, some financial and some salacious, that Russian agents might use to compromise or blackmail Trump. At the news conference Monday, a reporter for The Associated Press asked Putin directly if he had incriminating material on President Trump. The question caused a stir in the ornate ballroom filled with dignitaries from several countries. Putin dismissed the idea with a wry smile, noting that as a former KGB officer he knows "how dossiers are made up." While he never actually denied having such a file on Trump, he said the allegation that the Russians spied on him during a business visit to Moscow years ago could not be true. "There were over 500 American businessmen — the high ranking, the high level ones," Putin said, adding, "Do you think that we tried to collect compromising material on each and every single one of them? " Extraordinary as these exchanges were for a post-summit news conference, they were overshadowed by the event's most stunning moments — the Trump responses when he was pressed about Russian interference. Not once, not twice, but repeatedly the U.S. president refused to demand satisfaction, or an apology, or a promise that such interference would cease. Instead, he said the two nations needed to get along and the probe of Russian interference was getting in the way. Both countries were responsible for the difficult state of relations between them, Trump said. There was no mention here of Russia invading Crimea and East Ukraine, nor its actions in Syria or aid to Iran or its nerve agent attacks in the United Kingdom. Throughout the event on Monday, Trump held the issue of hacking in 2016 at arm's length, as though it were merely a theory. He did so despite the fact that 12 Russian intelligence officers were indicted three days before, by name and rank and title, in the extensive and insidious effort. The indictments were announced by Rod Rosenstein, the deputy attorney general for the U.S., based on evidence from the probe by special counsel Robert Mueller. Some have suggested the indictments were timed as a warning to Trump not to hold a closed-door, one-on-one meeting with Putin at this moment. And after Trump's news conference in Helsinki on Monday, another Russian was charged with cultivating political relationships inside the United States as part of Moscow's efforts to influence the U.S. in 2016. Democrats and some Republicans urged Trump to cancel or postpone the sit-down with Putin. But Trump persisted. It came to seem as if the rendezvous with his Russian counterpart was the driving purpose of his trip, more than the NATO summit or his call on Queen Elizabeth II at Windsor Castle. 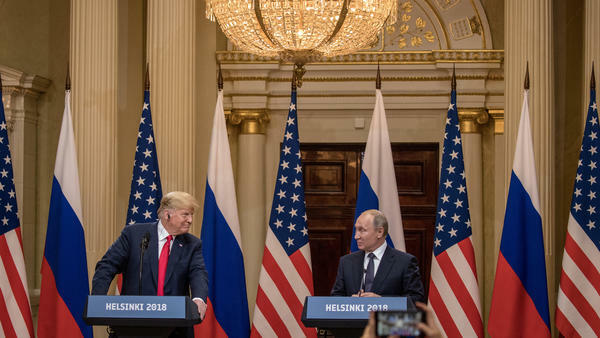 Then the moment came, in Monday's news conference, for Trump to reveal what the Putin meeting had produced on the issue of Russian interference. Instead, Trump began talking about Hillary Clinton's missing emails and the "brilliant campaign" he had run in 2016 — citing the tally from the Electoral College. It was as if the need to keep that Election Night feeling alive was greater than the need to deal with the geopolitical situation at hand and defend the international rule of law. Greater also than the need to support NATO and its mission to hold Putin accountable. And greater than the first commitment of any president to protect the national security and preserve the democracy of the United States.